If your ambition is to gain a senior site management role within the construction industry, our Construction Management BSc will set you on the right path. In the UK, the construction industry employs over two million people and there’s never been a better time to gain exposure to every aspect of the built environment in Birmingham, as it is currently undergoing a huge and exciting regeneration period. Our Construction Management course matches the needs of the industry, preparing you to be able to manage a construction project from inception and design through to occupation by developing your skills in management to enable you to deliver projects safely, on time, on budget and to the highest possible quality. The complexity of construction projects requires construction professionals who have expertise in construction management and can work effectively with people from different cultural backgrounds and construction disciplines. You will learn about the immediate and long-lasting effect which construction activities have on the environment, and discover sustainable and environmentally sound construction methods and innovative management practices. This course has social innovation embedded in its core. You will learn through creative social problem solving, working with our industrial partners to develop your intellectual and practical competence, as required by professional bodies such as CIOB and RICS. After completing this course, you will have a broad range of knowledge of the legal, technical, managerial, economic, social and environmental aspects of construction projects, and be able to confidently manage both commercial and civil engineering projects. The course content has been developed in line with the requirements of two professional bodies, the Royal Institution of Chartered Surveyors (RICS) and the Chartered Institute of Building (CIOB). Strong links with employers such as Willmott Dixon allow you to apply what you learn in a practical context through work placement opportunities. You’ll also have the chance to work on live projects for clients. It’s an exciting time to study construction in Birmingham – the city is undergoing huge regeneration. The Big City Plan, a 20-year vision covering every aspect of the built environment, is creating innovative redevelopments and opportunities. By undertaking further suitable work experience and the Professional Review, you can apply for full membership of CIOB and AssocRICS following the Assessment of Professional Competence with the RICS. You will have the opportunity to take part in international competitions such as the Associated Schools of Construction (ASC) Design and Build competition, giving you an opportunity to apply your skills to real-life projects. Our students have an impressive track record in these competitions and have had the opportunity to travel to competitions in locations across the world including Dallas, Texas. In this module you will cover core areas required in designing and setting up a contract. It is designed to give you an understanding of the procurement process and how it can deliver on a range of benefits to clients, contractors and other stakeholders involved with the development process. During the module, you are required to develop your knowledge on issues that affect the choice of a procurement strategy by evaluating various projects and the best management and procurement approaches to be adopted. You will also learn about how the choice of procurement strategy will impact on time, cost, viability, quality and sustainability issues. Current issues influencing procurement, such as international markets, legislation and sustainable procurement, will also be covered. This module has been designed to enable you to use problem-based learning to understand the Technology of Civil Engineering and innovation now being applied by Construction Managers. You will expand your skills in interpreting information about project sites and you will develop a wider understanding of operational and constructional processes. This module will explore the wider implications of the key factors which affect the selection of both traditional and new building methods and materials used in the construction of new build commercial and industrial buildings and introduce environmental and mechanical services systems which need to be installed in these buildings. In particular you will gain an insight into the operational complexities involved in the construction of large-scale commercial and industrial buildings to ensure that projects are delivered in time and on budget to meet the required standard of quality. You will be given a real construction project in which you will become increasingly aware of your own impact on the environment and communities we work within. Through group work, reporting writing and presentations you will develop the self-confidence to critically reflect upon your own leadership and problem solving skills via an integrated project delivery. This module aims to facilitate both knowledge and professional practices involved in commercial management at an undergraduate level. The module acts as a major platform for both the quantity surveying and construction management professions in preparing you for level 6. This module aims to deliver both knowledge and technical skills required to plan and program activities for a construction site at an undergraduate level. The module delivers a breadth of knowledge on major areas of the construction process. This includes site set up activities, different aspects of health and safety, accountancy of risks and risk assessment, planning and programming, data and information management, communication and management theories, and the role of CDM regulations within a construction project. Further deepening your knowledge and understanding of contract law and procurement, this module will provide you with the hands on experience of designing and executing a contract, which is a core requirement of you, as a construction professional. This module will introduce you to the various forms of contracts and the responsibilities of the people involved in executing a contract. We will pay particular attention to roles of the key people and clauses in FIDIC, JCT and NEC3 contracts. Issues such as clauses on the provisions for extension of time, managing change, and resolution of disputes arising in the execution of contracts will be covered. The module explores and applies architectural engineering principles to the construction, planning and design of buildings / structures in order to create a built environment that is energy efficient and environmentally friendly. Through the study of the structural integrity of buildings and energy management issues, the module seeks to promote the construction management process as a part of a creative, practical and interdisciplinary / collaborative approach, with involvement from the earliest stages of the design process, to consider new and evolving demands from all stakeholders and the use of new materials and assembly techniques based on the need for more sustainable buildings. This module will provide you a critical perspective on the nature, and a number of essential aspects of construction projects together with the approaches and techniques to manage them. The module will establish construction projects as an organisational entity, and highlight the two main approaches to the management of projects. The first one is the functional management approach which is largely based on structured techniques and methods, and the second one is the organisational management approach which sees management as an ongoing social and organisational process. You will be introduced to both approaches, and shown how to use them in a balanced way for the successful management of construction projects. While the organisational management approach to project management will provide you the intellectual skills that you need for project management, the functional management approach will equip you with the technical skills. Various assessment methods will be used in this programme to address the different needs of individual modules, including exam, essay, portfolio, individual/group presentation, and dissertation. Written and/or oral feedback and feedforward will be provided through Moodle, email, and group/1-2-1 tutorial. A personal tutor and dissertation supervisor will be assigned to each student for tailored support. Various other supports at university, faculty, school and programme level are also available (e.g. BCU library, student support tutor, Centre for Academic Success, EDS, SAP and Graduate+). You’ll have the opportunity to study in the USA. Our exchange programme with Auburn University in Alabama gives you access to the latest industry advances and including Building Information Modelling – skills that UK employers are crying out for. It has members all around the globe delivering knowledge and serving the public interest at a local level. In their work, they draw on RICS' ever-growing range of globally applicable and regionally specific standards and guidance. Dean is aspiring to become a Chartered Project Manager after studying Construction Management. 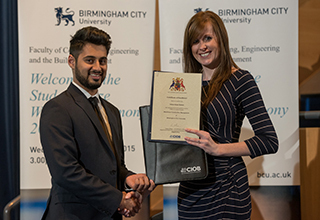 He received the Certificate of Excellence from the CIOB (Chartered Institute of Building) which is only awarded to a selective amount of students nationally. The staff, the students and the general environment around the university is very friendly and welcoming. The course gives you the skills needed to prepare for a career in construction management You’ll understand many aspects of construction technology, services and innovation relating to a wide range of building and civil engineering projects, with appropriate regard to health and safety and environmental responsibility. You’ll be able to project manage complex construction projects from an operational perspective and apply problem-solving skills. You’ll also have a strong understanding of any legal implications and cost issues, as well as global and economic aspects. A strong advantage of the practical element of the course is that you’ll have developed the skills needed to back up theory. These skills are highly valued by employers. Recent research conducted by the Construction Industry Training Board (CITB) indicates that the UK’s construction industry needs 36,000 new recruits each year to cope with increased demand. Our innovative collaboration with Birmingham City Council’s Urban Design Team means you can gain work experience, work on key individual research projects, gain technical application skills, win excellence awards and contribute to projects influencing future council policy. You’ll develop a range of transferable skills, such as how to communicate ideas and solve problems, as well as developing negotiation and planning skills. And because of the unique nature of the course, you’ll learn how to work effectively and efficiently either on your own or as part of a team. Students from the School of Engineering and the Built Environment will also be given a chance to take part in a major international construction competition hosted by the University. Prestigious firm Mott MacDonald, which has excellent links with the University, will sponsor the event. The delivery of the course is complemented by a range of visits to construction sites where you will be able to appreciate theory in context. Visits to construction sites will put theories into context and give you valuable insight. There are also walking tours around Birmingham itself to take in the city’s diverse architecture. Part of your learning activity will be hands-on, including carrying out survey work using a range of equipment, such as levels, theodolites and measuring tapes. Here at Birmingham City University you will make use of commercial software as part of your assessment. Work is carried out in well-equipped and air-conditioned laboratories.